Chicken is the most common type of poultry on earth, and is prepared as food in a wide variety of ways, varying by region and culture throughout the world. In North America barbecue chicken is often seasoned with a dry rub, grilled or smoked in a BBQ-smoker then coated with a tomato based barbecue sauce. Regional variations in the Southern USA include various cooking techniques and saucing differences. In North Carolina, thin tomato and vinegar based sauces are common, and chicken is often smoked slowly in a barbecue pit. In Texas, barbecue usually refers to beef, but many barbecue restaurants in Texas serve barbecue chicken seasoned with a basic rub of salt and pepper, sometimes called "dalmatian rub". The chicken is often served with a very hot vinegar or beer-based barbecue sauce on the side. In Georgia, slightly sweet sauces with quite a bit of mustard are used on chicken. In Alabama, egg or mayonnaise-based white sauces are sometimes served with chicken at the table as a dipping sauce. Quality BBQ chicken starts with quality meat. 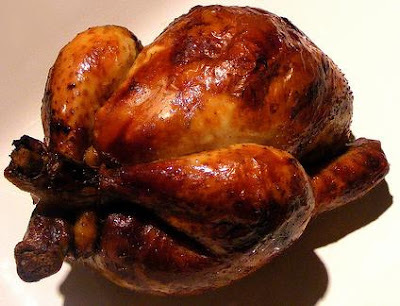 Look for a whole "Roaster" chicken 3-5 pounds, Grade A, free-range and organic. The extra cost of free-range-organic chicken is well worth the higher end taste and tenderness you will achieve. When buying whole, choose chickens that are meaty and full-breasted with short, plump legs. The skin should be smooth, cream to yellow in color and free of tears or bruises. Avoid any chicken with an "off" odor and check the date on the label for freshness. Before applying a quality chicken rub, rinse your chicken under luke-warm water both inside and out then pat dry with a paper towel. Apply rub liberally to the chicken both on top and under the skin and on the inside of the bird. A good BBQ chicken rub usually has salt, pepper, sage, thyme and/or bay leaves as its base. You can use almost any good quality rub recipe that would be used for pork shoulder or beef brisket. All great barbecue needs smoke. Smoke not only adds that authentic barbecue flavor but the nitrates in the smoke breaks down connective tissues and changes the very nature of the meat. For great BBQ Chicken use Oak, Pecan or Hickory as your base wood and fruit woods like apple or cherry to add a sweet flavour. Smoke Wood List. 2. Store in an airtight container until needed. Instead of a rub try this seasoning method. Good for 1 Chicken. Baste chicken with brush inside and out before putting in smoker. Baste again 1 hour into cooking. MrBBQ.ca © 2010. Powered by Blogger.